This landscape was taken from the the peak of Drei Schwestern, a mountain top in Liechtenstein. The view includes parts of Switzerland, Liechtenstein, Austria and beyond Lake Constance (Bodensee) even a piece of Germany. File size is about 2.2 MB. A new bridge is being built across de bay. The 360° panorama image was taken at noon of September 10th, 2012, from the pier of the small marina just closed to the Cadiz head of the bridge. The final picture is the result of stitching 11 frames, taken out of a 63 seconds full HD video, using PhotoStitch and Gimp 2.6.8. Panorama from within 2014 crop circle near Raisting Radome, Bavaria, Germany, 50 kilometres away from Munich, beside the earth station of the US-firm "Emerging Markets Communications Inc. (EMC)". This is a complete high resolution panoramic view of the St Peter's Square, City of Vatican. Gianfranco Mazzani photographed this panorama in july 2004 by using a Nikon Coolpix 8700, and stitched the original 10 pictures together into a spherical panorama using Hugin program. The panorama has been than cutted into 8 alfa channel pictures and re-dimensioned the width to 2048 pixel and then dimensioned the height to 32 cm by using Photoschop elements 2. Vauvenargues Observatory located near Aix-en-Provence, France. Panoramic view of the Saint Alexander Nevsky Cathedral in Bulgaria. See this panorama here Flash pano. This panorama was taken in August 2017 in Cuxhaven at the northern edge of Altenwalde Heath near the Feldherrnhuegel (53°50′02.8″N, 8°38′33.6″E). The former military training area became the core of the nature reserve "Cuxhavener Küstenheiden". File size: 10.3 MB. Resolution: 4096x2048 pixels. Also available in higher resolutions 8192x4096 (41.1 MB) and 16k old style (127.1 MB). This is a panoramic view of the Pico do Areeiro, the second highest point of the island. Madeira Island - Portugal. Ares is a small fishing village in Galicia, in the NW of Spain, close to the city of Ferrol. The 360 degree image was taken at the noon of August 6th, 2007, just in front of the "Paseo Rosalía de Castro". It has been made with 17 photos, stitched with Hugin 0.7 beta 4 and retouched with the Gimp 2.2.17. This is a panoramic view of the Place du Palais des Papes in Avignon. France. This site is part of UNESCO World Heritage. This is a panoramic view of the Pont d'Avignon (aka Bridge Saint-Bénezet) in Avignon. France. This site is part of UNESCO World Heritage. Saint Michel Bay - Serre Ponçon lake, Alpes - France. This panorama was taken in September 2014 — at the peak of heather flowering season — on Brunsberg hill (129 m above sea level) in Buchholz i.d.N. on the NW edge of Lueneburg Heath (53°18′01.0″N, 9°49′55.7″E). Brunsberg hill offers nearly a 360° view over large parts of the western Nordheide including Wilseder Berg hill (169 m), the highest elevation in the NW German lowlands. File size: 10.0 MB. Resolution: 4096x2048 pixels. This landscape was taken from the Caniga Country, near Sassari in Sardinia, Italy. A nearly flat rural landscape in southern Spain. The site has very dark skies and a view down to about 3° to the south. This is a panoramic view from the roof of the Secondary School of Cocentaina, a little town of the Pais Valencià (Spain), in the mountains that are between Valencia and Alicante, where I teach Astronomy with the help of Stellarium. Friedrich Noelle took a nice panorama of Observatory Hill, Edinburgh which Barry converted into a Stellarium landscape. This high resolution landscape was taken in April 2007 by Rob. Johan helped with the post production. The result is a very high quality landscape. The original English Garden landscape was re-constructed by Barry Gerdes as an old_style landscape. This means that it can be used with video hardware which cannot cope with single very large texture files, and yet preserves the resolution of the landscape (by splitting the images into multiple files). Try this is the original English Garden landscapes doesn't load on your computer. The Épendes Observatory (46°45′45″N 7°08′22″E) is located near the city of Fribourg, Switzerland. The images for this landscape were taken in August 2006. This landscape (old style format) is intended to be used on older configurations, where spherical landscape (above) doesn't appear because of low memory on the graphic chip. File size is about 2.4 MB. The Épendes Observatory (46°45′45″N 7°08′22″E) is located near the city of Fribourg, Switzerland. The images for this landscape were taken in August 2006. The landscape comes in three resolutions (1024 / 2048 / 4096). File size is about 2.4 MB. Note: If you have problems with this landscape (landscape doesn't appear because of low memory on the graphic chip), use the corresponding old style landscape below or use a smaller resolution (see the README file in the package). Cozy russian village, 50 km northwest from Tver. Russia, Caucasus. The astronomical science station on the mountain Shadjatmaz. This is the view from amateur's observatory (by Andrey Kuznetsov, Sergey Kiselev). This panorama was taken in May 2014 on the Gnevsdorf Weir island (52°54′25.5″N, 11°53′00.0″E) at the confluence point of rivers Elbe and Havel (Gnevsdorfer Vorfluter) in Gnevsdorf near Ruehstaedt, a village famous for its large population of breeding white storks during spring and summer. File size: 10.3 MB. Resolution: 4096x2048 pixels. This landscape was taken during a summer evening from the top of Granholmstoppen, an artificial hill in north-western Stockholm, Sweden. This landscape was taken during a winter night from the top of Granholmstoppen, an artificial hill in north-western Stockholm, Sweden. Panorama from Grantchester Meadows, Cambridgeshire, UK in March. Flat horizon. This is the site of the Bern Astronomical Society's observing site. This panorama was taken in August 2016 on Panoramaweg road at Rottsberg hill in Hildesheim, about 3 km west of the city centre (52°08′11.3″N, 9°54′44.5″E). The photo shooting site, located 115 m above the Hildesheimer Börde lowlands, offers an outstanding view upon nearly the whole city. File size: 10.7 MB. Resolution: 4096x2048 pixels. Also available in higher resolutions 8192x4096 (38.6 MB) and 16k old style (123.1 MB). Nuraghe Iloi is a megalithic sardinian edifice in the town of Sedilo, a village in the center of Sardinia (Italy). Sedilo is famous for s'Ardia, the horse race in honour of Saint Constantine the Emperor which takes place every year in Sedilo in the evening of July 6 and is repeated on the morning of the 7th. KAIRA (Kilpisjarvi Atmospheric Imaging Receiver Array) is a project of the Sodankyla Geophysical Observatory. KAIRA is a dual array of omni-directional VHF radio antennas, principally funded by the University of Oulu in Finland. It makes extensive use of the proven LOFAR antenna and digital signal-processing hardware, and can act as either a stand-alone passive receiver, as a receiver for the EISCAT VHF incoherent scatter radar in Tromso, or for use in conjunction with other Fenno-Scandinavian VHF experiments. In additional to being a powerful observing instrument in its own right, KAIRA will act as a pathfinder for technologies to be used in the proposed EISCAT_3D radar system. La Guardia is a fishing village in Galicia, in the NW. of Spain. This landscape was taken on the 19/07/2008 at 12:38 p.m.
Johan photographed this panorama in June 2006 and stitched it together into a spherical panorama that can be used with Stellarium. You see sandstone cliffs on the Atlantic coast of southern Portugal, a lighthouse, and a natural bridge. This landscape was developed from a panoramic picture of the Leist in Switzerland (2222m). This is a panoramic view from the top of old Water Tower 56m above ground, constructed 1906/07, in Lueneburg, a town with many retained medieval houses. Northern Germany. View of the old quarter. High resolution 360° landscape taken at Larvotto beach in Munegu \ Monaco - MC (MonteCarlo) - Europe \ Mediterraneum Sea - Ligurian Sea. This is a panoramic view of the Roman Theatre of Orange- France. This site is part of UNESCO World Heritage. Ovindoli is a famous ski resort in central Italy. This landscape shows the planetarium "Samuel Heinrich Schwabe" in Dessau (Germany). This is a panoramic view of the Rila Monastery in Bulgaria. This building is quite high so the sky area is not really large. This site is part of UNESCO World Heritage. The Frantoio Rodiano (Rodiano oil press) is situated on the foot of Mount Gargano in Puglia / Italy. Just a few kilometers uphill lies Monte Sant'Angelo, the famous stop for christian pilgrims on their way to Jerusalem. Stargazing has been kin to this region for milleniae: the oldest graves found in the Frantoio's vicinity date back to pre-etruscan times, and the famous Castel del Monte, an astronomical observation in itself, is not far either. 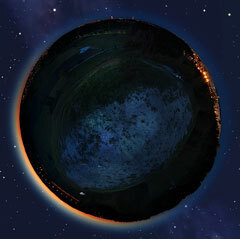 The spherical landscape was created from 8 images taken on September 20th, 2010, at 1707, from the uppermost terrace of the Frantoio Rodiano. The landscape comes in three resolutions (1024 / 2048 / 4096). Panoramic view from the center of Rousse in Bulgaria. See this panorama here Flash pano. This is a panoramic view of the Colorado de Rustrel in "Les Sentiers de l'Ocre et du Fer", Provence, France. Sa Calobra is a small village in the Escorca municipality on the northwest coast of the Spanish Balearic island of Majorca. The port village is a popular destination for coach trips and road cyclists and is accessible by a single winding road, designed by Italian-Spanish engineer Antonio Parietti and opened in 1933, which features many hairpin bends and a 270° spiral bridge called the tie knot. The climb is officially called the Coll del Reis or the Col de Cal Reis, the pass on 682 metres (2,238 ft) altitude, though it is often referred to by the name of the village at its base and was built and is considered to be "as close as one could get to a perfect road for motorsport". Unconventionally the road was engineered with tourists in mind. This panorama was taken in April 2014 in Cuxhaven on Sahlenburg Beach, beach access point Wernerwaldstrasse (53°51′33.5″N, 8°35′22.3″E). Cuxhaven is a well-known seaside resort and harbour town in northern Germany. The Wernerwald forest (SE) is visible, as well as the Wadden Sea with the Isle of Neuwerk (NW). File size: 10.9 MB. Resolution: 4096x2048 pixels. The sanctuary of Saint Constantine is a country sanctuary of Sardinia, located on a hill called Monte Isei, in Sedilo a village in the center of Sardinia (Italy). The church, the fulcrum of the sanctuary, it's protected by ancient walls and it stands within a large sloping area, inside the hill, from which you can enjoy the panoramic view of the nearby Lake Omodeo. Observation site at 25 Km from Bordeaux — France (a fine mask of light has been added to N where the city is). This place is located at 44.62 N 0.63 E and it is the observation place of the astronomy club: AG33. This landscape is 4096 pixels wide and file size is about 25 MB. The 2048 pixels version — 6.7 MB, can be downloaded here. This panorama was taken in April 2015 on the windward side of Schmoelen Dune in the Loecknitz/Elbe valley near Doemitz (53°07′25.0″N, 11°17′34.1″E). With its size of 2 km in length, 600 m in width, and a height of more than 30 m above ground level, Schmoelen Dune is Europe's largest inland dune. File size: 12.7 MB. Resolution: 4096x2048 pixels. View from the roof of the observatory of Gymnasium Šentvid, Ljubljana, Slovenia. This panorama was taken in May 2014 on a meadow between the Distelweg football playground and the horse pasture at Thomasfeldweg in Buchholz-Seppensen (53°18′11.5″N, 9°51′54.9″E). Seppensen is a rural part of Buchholz, a 40,000-inhabitant town in the German state of Lower Saxony approximately 30 km SW of Hamburg. File size: 11.4 MB. Resolution: 4096x2048 pixels. Panoramic view of the Silistar Beach in Bulgaria. See this panorama here Flash pano. High resolution 360° landscape taken at "LaPelosa" beach in Stintino (SS) Sardinia \ Italy - Europe \ Mediterranean Sea. Was it an observatory? Yes indeed it was! The alignment of the monument with the summer solstice sunrise has been well known for many years. The alignment with the winter solstice sunset may have been more significant. For the first time, many additional alignments are published, and are detailed here: www.brontovox.co.uk These alignments demonstrate that Stonehenge was primarily a functional scientific instrument, used for measuring angles. The angles of interest were the rising and setting bearings of the sun, moon, and stars. 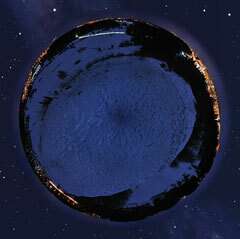 It was therefore possible to map the entire visible sky. This landscape depicts Stonehenge - the famous prehistoric monument in Wiltshire, Southern England. Sylvain photographed this panorama in February 2007 and stitched it together into a spherical panorama that can be used with Stellarium. This is the panoramic view from the terrasse of the professional 106cm telescope at Pic du Midi Observatory (France). Sylvain photographed this panorama in February 2007 and stitched it together into a spherical panorama that can be used with Stellarium. This is the panoramic view from the amateur 60cm telescope dome from T60 Association, installed at Pic du Midi Observatory. This is a small village between Moscow's and Kaluga's regions, in 130 km south-west of Moscow (55°18'32.46N, 36°26'42.06E, alt=195). Site of the old military airfield. A view from a garden in the village of Uvalno, Czech Republic. This is a panoramic view of the St Peter's Square. City of Vatican. Some parts of the buildings are missing, not enough pictures... This site is part of UNESCO World Heritage. Steinar Midtskogen sent this huge (17 MiB!) spherical landscape image of Voksenlia, Oslo, Norway (59°58'14N, 10°38'57E, alt=348m). (Currently not working with version 0.9.0). A view from the outskirts of Vienna. Moriz Edler von Kuffner's observatory (48°12'48"N 16°23'48"E) was built in the 1880s in todays 16th district of Vienna. The pictures on the wall were added to acknowledge it's rich history, including the still largest heliometer worldwide. This landscape was created in late summer 2013. File size is roughly 15.6 MB. Woodhenge near Stonehenge was constructed around 2200 BC. It comprised numerous wooden posts set into the chalky ground. These posts of course decayed, and their positions today are marked with concrete cylinders. The posts are arranged, in plan view, as a series of concentric egg shapes. The axis of the egg shapes aligns approximately with summer solstice sunrise. The Urania Observatory (48°12′41.88″N 16°23′1.53″E) is located right in the middle of the city of Vienna, capital of Austria. Built in 1910 under emporer Franz Joseph I. it's the countries oldest non-scientifical observatory still in use for people's education. This landscape was taken in August 2011. If you are not distracted by the stars, you can even see St. Stephan's cathedral, the Viennese Giant Wheel and the Danube Canal. File size is about 11.5 MB.